The first of the men’s semifinals Friday night saw the #2 ranked Canadian Mennonite University Blazers take on a short benched St. Boniface College. The Voyageurs were without standout Stéphane Waldie, and his absence on defence was evident against a high flying Blazer team. St. Boniface took early control of the first set, but it was all Blazers once they were tied at 15. CMU took the first 25-21, after two momentum swinging blocks by Josh Kruger. The second set was an impressive defensive and offensive display by St. Boniface’s Sylvain Bourgeois, but gigantic kills from Blazer standout Shawn Franz elevated CMU to a 25-15 win. 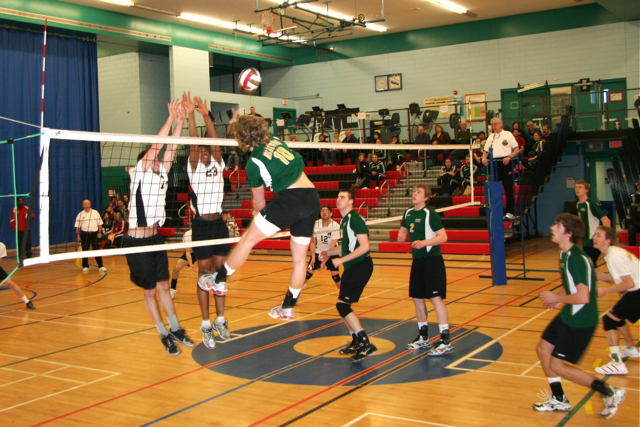 The final set was tied at 8 with a few long rallies before the Blazers pulled away and won 25-19. St. Boniface’s player of the game award was given to Sylvain Bourgeois, while Corey Dueck took the honours for the Blazers. Canadian Mennonite will try to knock off a heavily favoured Red River squad in Saturday’s championship final at 8 p.m.